Was at Caesar's Palace Casino for dinner when I encountered this section of the gaming area. 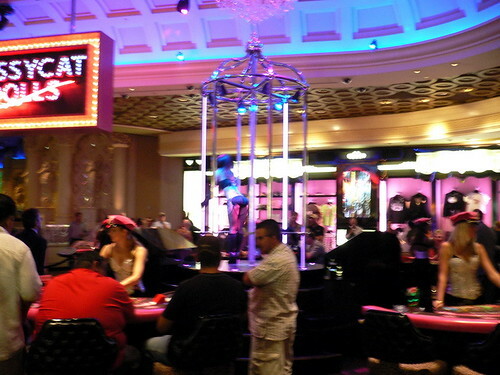 The dealers were all sexily clad in bustiers and very very nice slacks and heels while in the back are two cages for dancers to do their thing. Wah raoz..... like that how to concentrate? That is so below-the-belt leh.... purposely choot this type of pattern, how the players going to stay focused? Confirm kena distracted until jialat jialat. Fortunately, I stayed at the Monte Carlo and kept my gambling confined there only. Otherwise, I sure lose until buay leen choo. not only that, if you are a pan-tang person, even women underwear will surely let you curse up down left right..
What is white tiger? Anyway you ownself got roaming eyes don't blame the scantily clad women ok.
How about you go ask Jeffwee? wahhahha.. i could only presume what "white tiger" is meant to me, that is a clean shaven private area..
Gary: If I may add a little more, is that it refers to the female gender and in Ch1nese superstition is considered extreme bad luck. akk: That I will never be able to find out. You will have to do it and let me know. I suppose it's difficult be concentrate...lol excuse my english very bad !! aurore: Don't worry about your English. Since I can understand what you wrote, your English is ok.